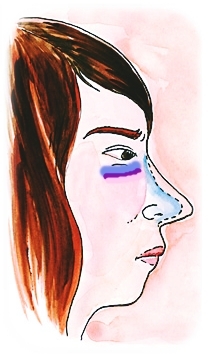 After rhinoplasty surgery, bruising and edema around the nose and nose may occur in amounts which may vary depending on the amount of bone interventions performed, the skin structure of the patient and the genetic characteristics of the healing process. In women with white skin and thin skin, bruising and swelling may occur more easily after surgery. Many patients "when the rhinitis bruises pass?" asks the question. It usually increases bruising and swelling during the evening and the next 3 days of surgery. Then, it decreases and the green areas are greened and disappear within 2 weeks. Arched nose, light colored and thin skin structure of the bruise can be seen more! Excessive skin structure, light complexion and a large amount of bone arch need to be pruned on the nose may cause a greater degree of bruising after surgery. As the amount of blood leaking into the skin increases, it is easily recognized as bruising, especially in those with skin structure. There are clinics for cortisone injection during surgery for bruising and swelling abroad. In addition, keeping the blood pressure low during surgery, minimal traumatic procedures and keeping the operation time short may contribute to the reduction of bruising and swelling after rhinoplasty.